Our contact for this concert event has indicated that while the public is welcome to come and enjoy this free concert, there will be a security check required to get on the base. Please allow an extra 30-40 minutes to get through the security gate when you arrive at the base. Everyone must have a picture ID (children are not required). This applies to passengers in vehicles as well as the driver. If you do not have a military decal on your vehicle you should expect to be asked to pull into the vehicle search area. The MP's are very polite and professional, however they have a job to do and they will search your vehicle both inside and out and sometimes with dogs. Given today's environment, this process has to be done. 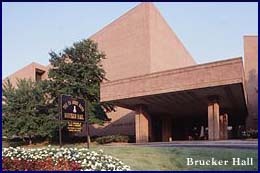 When asked, everyone should tell the MP that they are going to the Army Band building (Brucker Hall.) The MP will be able to give the simple directions on how to get to the building from the gate.